Join many other High Point businesses that trust VERSA Technologies to setup your business communications and network systems. 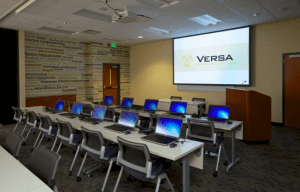 VERSA is a single-source provider for all of your communication needs. We strive to enhance your business communications and network systems so you can maintain excellent communication and network security. Discover the right business technology solutions in High Point for your organization below. Installing the proper cabling system is essential to any business. Our experienced team can help you set up a well-performing system for your business. We offer all types of communication applications, including voice, data, video, sound, and surveillance. Explore our structured cabling services in High Point, NC. Working with one vendor in High Point for your Network Carrier Services will make it much easier to meet your business needs. Integrating new network technology equipment and services into your core communications infrastructure is easy with VERSA. As a single-source business technology partner, we’re able to streamline the process. Learn more about our IT solutions. We offer scalable and easy-to-operate IP Business Communication Systems in High Point to meet your needs. VERSA has direct partnerships with Toshiba and NEC to provide high-quality VoIP telephone systems that can help improve productivity and strengthen communication internally and with your customers. Contact our High Point office at (336)765-2004, or reach out to our offices in Winston Salem, Greensboro, Charlotte and Raleigh.